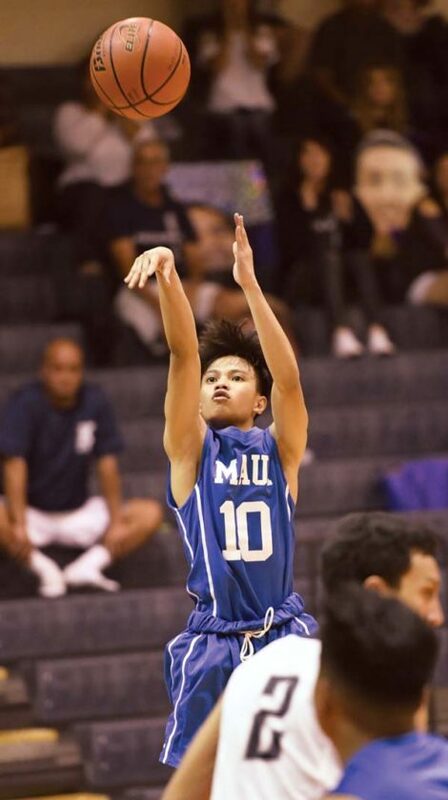 LAHAINA — Austin Peters used to watch Kamehameha Schools Maui basketball games when he attended the grade school on the Pukalani campus. 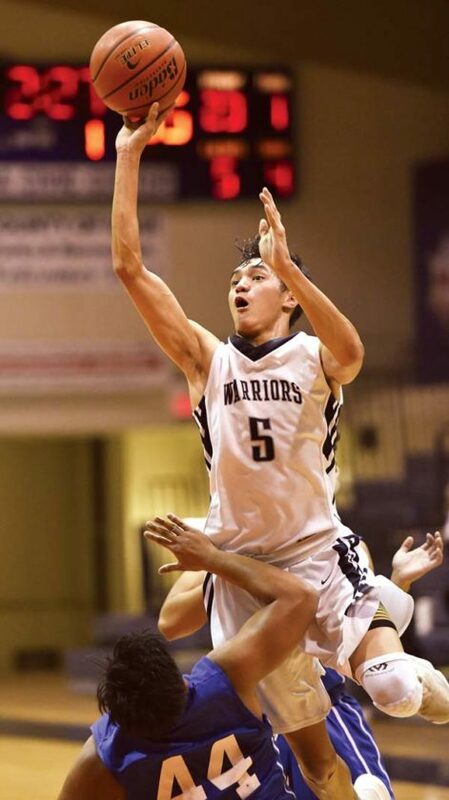 The Warriors’ senior point guard led them back to the state tournament for the first time since he was in the 4th grade on Wednesday night with 18 points in a 59-50 win over Maui High. Kamehameha Maui (7-8) will host a first-round game at Kaulaheanuiokamoku Gym on Monday in its first state tournament appearance since 2010. Maui High’s season is over at 6-8. “It’s an unbelievable feeling, we’ve never made it that far in a while,” Peters said after the Maui Interscholastic League second-place playoff game at the Lahaina Civic Center. 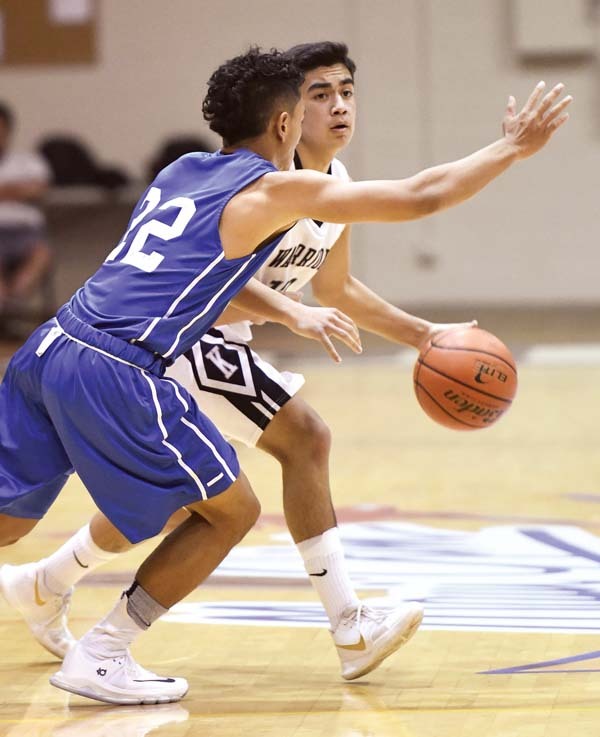 The back-and-forth game was tied at 44 going to the fourth quarter after Maui High’s Keoki Agtaguem capped a 6-0 run by the Sabers with 50 seconds left in the third. 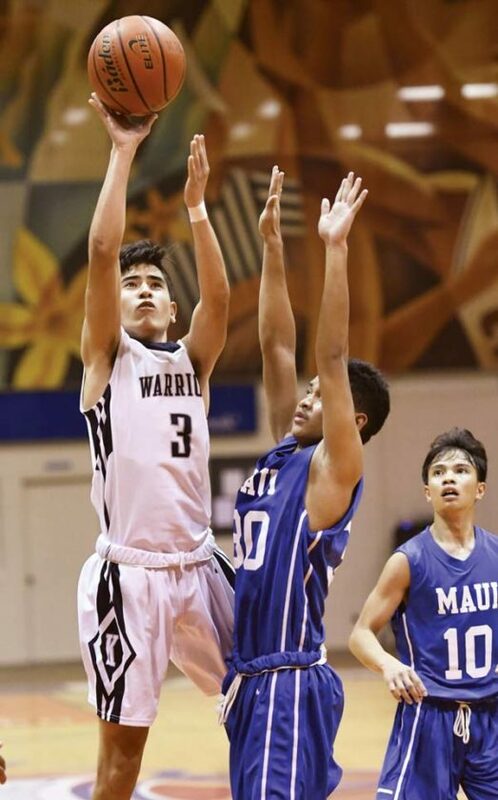 Kamehameha Maui’s Kamalu Segundo releases a shot over Maui High’s Scott Magno. Jojo Pacubas gave the Sabers a 46-44 lead before Kahai Bustillos tied it on the other end. Peters gave the Warriors a 48-46 lead on a rebound basket, bringing a timeout from Maui High coach Steven Vega with 6:01 to play. Kamalu Segundo’s 3 with 5:20 to go pushed the lead to 51-46 before Scott Magno’s 3-point play on the next possession brought the Sabers within two. Peters made a free throw with 4:17 left to give the Warrior a 52-49 lead. Peters made two free throws with 1:17 left to make it 54-49, then grabbed the rebound on the other end and fed Bustillos on a breakaway three-point play to put the Warriors ahead 56-49 with 45 seconds left. Segundo, who had a game-high 23 points, hit a free throw with 33 seconds left and Peters hit two more with 22 seconds to go. Kamehameha coach Angus Peters III is Austin’s older brother and an alumnus of the school’s first graduating class in 2006. Angus Peters led the team to this game last season — his first at the helm — which the Warriors lost to Maui High. 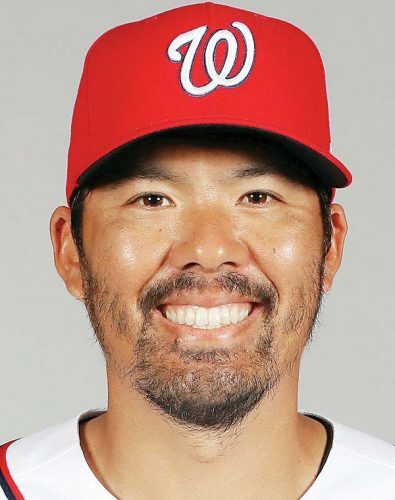 Kamehameha had been 2-37 in MIL play in the previous three seasons. Austin Peters of Kamehameha Maui is guarded by Maui High’s Chey Higashigushi on Wednesday. Vega said his team will bounce back. Magno had 11 points and Pacubas added 10 for the Sabers. Efren Villon 0, DJ Sable 2, Rexie Butihi Jr. 0, Jojo Pacubas 10, Brycetyn Boco 3, Chey Higashiguchi 9, Fransver Castro 8, Michael Villon 0, Kevin Cacho 1, Keoki Agtaguem 4, Jayden Ramos 2, Kea Aguirre 0, Scott Magno 11. The Sabers’ DJ Sable releases a shot. Kahai Bustillos 8, Blayde Demello 2, Kaimana Gerard 0, Kamalu Segundo 23, Beau Ramos 0, Henry Miguel 0, Austin Peters 18, Ronson Iniba 0, Tiliti Adams 8, Taj Falconer 0, Michael Kalalau 0, Iverson Dudoit 0, Colton Luke 0.